Let me first off start by saying one thing: a cobbler is not a shoemaker. This is one thing that bothers me and has just seem to have stuck in people’s heads since the dawn of time. Cobblers, at one point in time, did double as shoemakers and shoe menders, but in this day and age, they are simply people who fix other people’s shoes. Now don’t get me wrong cobblers can also be artisans, as shoe mending is quite different and can be quite difficult with respects to shoe making, but nevertheless, they are different. I state this because I feel that many people still believe that they are the same thing, or that they simply just don’t know that a bespoke shoemaker is by no means a cobbler. It’s like calling a pattern cutter (of suits) a tailor and asking him to hem your trousers. If you do this, you would be insulting that individual to the fullest, as their years of extensive training will seem like nothing. Same thing for a bespoke shoemaker. That being, let me get on with the rest of the post. The reason that I am writing this, is because I had a less than satisfactory experience with a ‘cobbler’ here in London (back in 2012). I can’t really say that they did a bad job, but I do have to say that the service was quite disappointing to say the least. I had realized that I had quickly worn down my toe area and that if I wore my shoes any more I would grind it down to the welt. That being, I was in desperate need of some toe taps (aka blakeys and/or lulu’s). I thought that while I was at it, I would also ask them to replace the top piece of my heels as well. Now having done a bit of repairs while learning how to make shoes, I can do both of these things, but in reality can’t really be asked to do so as time is tight, space is limited (to make a mess) and the materials are sometimes hard to source, at least in small quantities. Therefore, I decided to go to a place that I had never tried (of which I won’t name) yet of which I had seen some of their work done on a customers’ shoes and knew that they could do a proper toe taps. 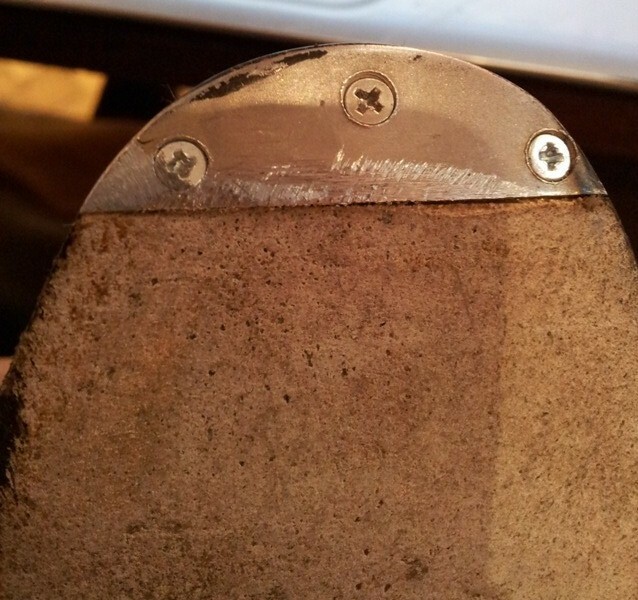 Now, a proper pair of toe taps (Lulu’s as it were, as pictured above), is one that you have to slice a bit of the sole down in order to screw it on and then make flush with the rest of the sole. This is not to be confused with those rubbish blakelys that most cobblers here in England use in which they just nail on some piece of crap metal that falls off within a matter of single-digit wears. I had used a few cobblers before here in England. One was in Brighton and the other was in the West End. The West Enders are pretty good, but will blurt out a price based on how I am dressing that day….nothing that seems to ever be fixed, which is a bit off-putting. 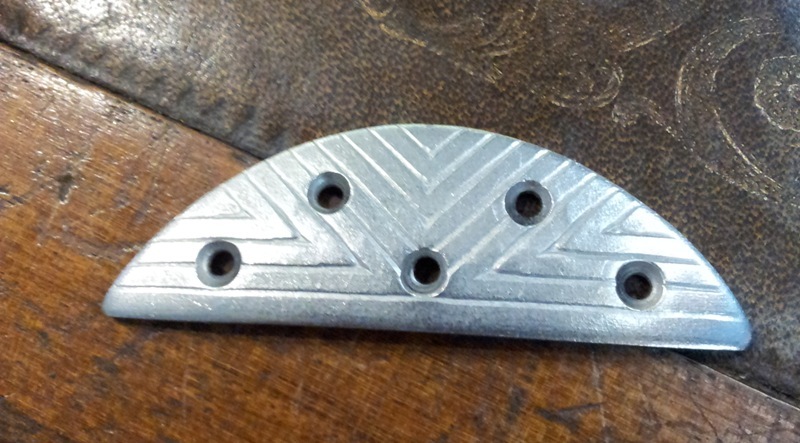 While once replacing the top piece of my heels on one of my bespoke pairs, I had sent the shoes to a cobbler and when all done I had noticed that they had put on this “polish” that they use to finish off the shoes with those fast spinning brush wheels. This crap smelled like gasoline mixed with motor oil and was so horrible that it set into my leather immediately. Needless to say, as they were my black/red bespoke saddle shoes (my absolute favorites), I was furious. I immediately went back to work and stripped them down with alcohol in order to get that stuff off of my leather, before it ate it all away like termites on wood. So, having been scarred from this experience, I kindly asked the cobblers that I was now going to, to please not use any sort of varnish to finish my shoes and if necessary to replace the heel and leave the shoes as I would re-dye them myself. They assured me that they don’t use any chemical type stuff, so I trusted them. What a mistake that was…. 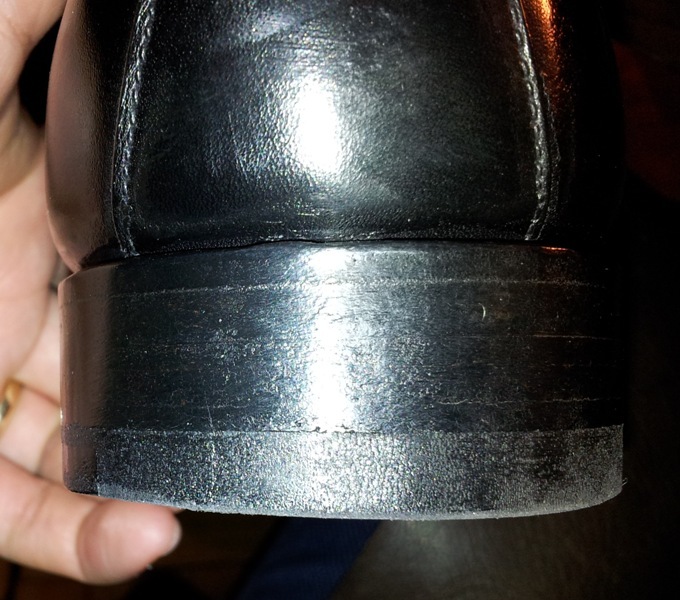 Needless to say, when I received the shoes back (from a delivery to my work as they were not done when I went in to get them, nor had even started), I immediately saw that they had used the very stuff that I had asked them not to, and it was already leaving salt-like stains on my leather. Because it was dire, I did not take a picture to show all of you, but quickly rubbed it all off before it began to ruin my leather. I also noticed that they did not use the same quality blakey that they had previously showed me in the shop, instead using a much cheaper and, in my opinion, more fragile looking one. And on top of that, they were incredibly crooked and were not flush with the sole, meaning that I was going to have to sand them down with a filer. As you can imagine, I was quite disappointed and feel that I am not the only one who has used London cobblers and has felt the same. Time after time again, I see customers who have taken their shoes in for a re-sole and the job that has been done was appalling, so bad that the cobblers did not even bother to take out the old thread but just stitched right over it, creating a disgusting mess on the welt line. It makes me truly curious as to how London (England) is so famous for its shoemakers, but how awful many of their cobblers are. Truly astonishing….. Now, that being, I do get asked by many people to recommend a good cobbler here in London, but I really cannot do so with any confidence. Therefore I need your help. If you are a reader from London and know of a really good cobbler, please do share it in the comments section as I am sure that we would all appreciate it! 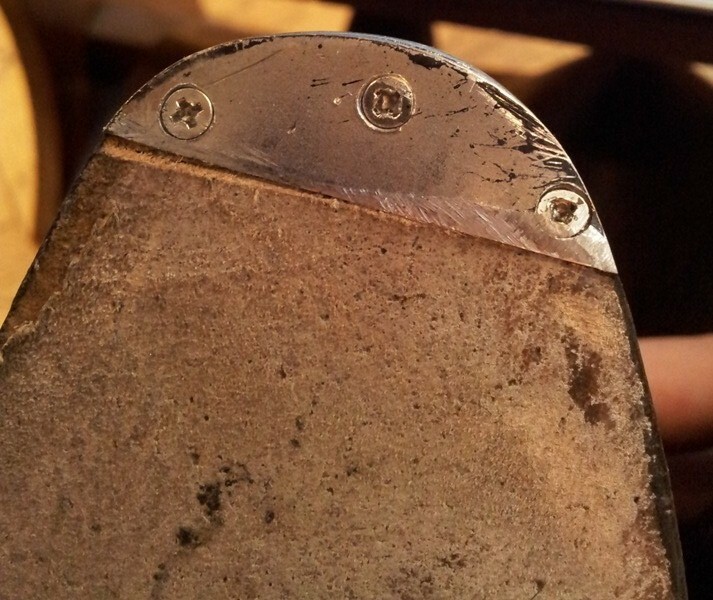 This post being a few years old, I wanted to share again with you the horrors of just using any old Cobbler. Today, I use Tony’s Shoe Repair in Crown Passage in St. James area. 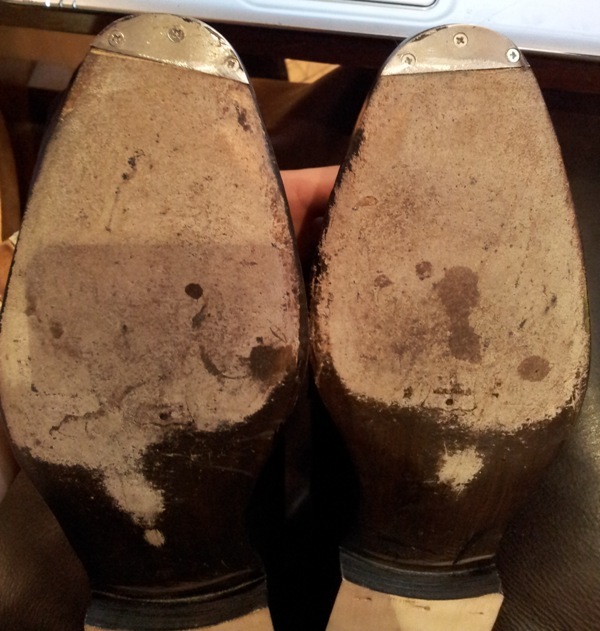 You can read about him HERE where he fixed this same pair of shoes and see the difference in the workmanship. Sorry to hear that Justin as you would think that London cobblers especially would know their stuff. I am in Dublin and find the same problems, over the past 15 years most of the real cobblers has been replaced with these consession outlets in big stores/supermarkets that do everything from key cutting to laundry. I can’t help you with finding a local cobbler, but I can thank you for discerning between cobblers and shoemakers. I’m learning about 18th century shoemaking and it’s the same back then. The shoemaker had large shops, often with a number of workers. Translators, who took old shoe parts and combined them into serviceable shoes, often had small shops. Cobblers, on the other hand, were often pictured with shanty tents to the side of a building. A vast difference in knowledge and expertise. I used to use KoKo’s in London in East Finchley. They are the best I have ever come across. To give an example, I purchased a pair of Louboutins for my girl a while ago, and she decided she was slipping out of the heal, so I had KoKo build up the inside heal of shoe and they did a beautiful job. I also used them for repairs while working in a shoe store in Clifford St for years. They pick up and deliver. They are the next best thing to sending the shoe back to the factory. I agree with Christian: KoKo’s are excellent. I had a pair of Berlutis re-soled there and I took some photographs of the beautifully finished product before I had the unfortunate task of having to wear them outdoors – One cannot be too precious though. Luckily for me they also use genuine Berluti soles and charge about the half the price of going direct. Look forward to seeing the new brand. I wonder if it has to do with the quality of the shoes the cobblers usually work on? I have a quite good shoe guy here in the midwestern US – I’m not sure how he’d do on Berlutis or something extremely delicate but he’s done a very nice job on some Aldens and Trickers – and from our many conversations, I know that he most often does repairs on cheap, glued shoes, regluing them, fixing up bits of the uppers that come off, gluing breaks in cheap imitation “wood” high heels. So naturally, he doesn’t have as much opportunity to keep in practice with fancier work. Now, he’s a rare gem, someone who really loves shoes. He was in retail for years, used to send people to a particular nearby cobbler, then apprenticed himself there and finally bought the business. He knows a tremendous amount about US-made shoes and the various companies that used to exist up through the eighties. 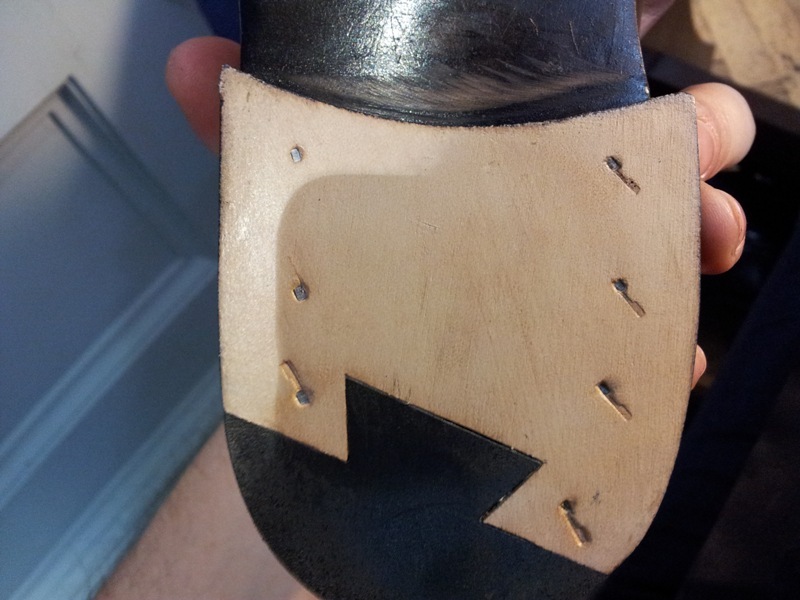 I have no direct experience of them, having never used them, but 5th Avenue Shoe Repairers on Goodge Street get a very good review on BespokeMe blog spot. (Though I can’t imagin you have any) it might be worth trying them out with a poorer quality shoe that you are not too precious about. Not sure where you’re based Justin, but I’ve always had an excellent service from Classic Shoe Repairs on Brecknock Road (N7, just outside Camden). As with KoKo’s, their finish is practically factory quality, and they’ve done some wonderful rescue jobs for me in the past. I have also had similar problems in the past. Now I just take my shoes back to the maker for any repairs – it may cost a little more, but at least I know that the shoes are in safe hands. That being said my local cobbler/key cutter (based outside of London) did an excellent job re-soling a pair of chukka boots with some dainite soles. The boots looked brand new. Here’s hoping this thread points us all in the direction of a good cobbler. Funny that PRP recommends Classic Shoe Repairs – I was hunting for somewhere to repair a handbag last week and their name came up more than once from those in the fashion industry. 1. Are you sure those toe pieces are made by Blakeys? I searched on their website but couldn’t find them. 2. I haven’t been able to find a cobbler in Hong Kong who have them. Wonder if you will be selling them at your eBay shop? Anon – Thanks for that, I was just about to change it when someone told me that the maker wanted me to take it down….he must not want people knowing about him? Oh well…. Tony – Yea you are right, it’s hard to find a shop that is strictly a cobbler and nothing more. Those darn key cutters are hard to beat though, guy was charged me a fiver for 10 seconds of key cutting. What a profit! ColeV – 18th century shoemaking, what an interesting subject! Enjoy that! Thanks for the comment. Christian – I will have to give them a try next time I need sole’s replacing, whenever that may be?? Thanks for comment my friend. I hope that you are well. Alex – Thanks for sharing Alex! Lark – I understand where you are coming from, but I feel like skill is skill, no matter what you are working on. I just think that these cobblers just don’t care, it’s about quick turnover, not really making sure that you do the best job you can no matter how long it takes. Money is what they seem to focus on, not actually giving back the customer the best thing that they possibly can. Nice though that you have someone who actually cares…indeed a true gem! Snapper – Thanks Snapper, I will have to check them out sometime. PRP – Well it would seem that KoKo’s is the big winner as most of you recommend them. I guess that it is them from now on. Thanks! Matt – Yea, I don’t think it’s the cost that deters from sending back to the factory, but the turnaround time. Sometimes they won’t give you the shoe back for 3-4 months. I could not wait that long for shoes that I wore a lot…no way! But yes, it is always the best option, quality wise. Simon – Nice, looks like this is becoming a thread where everyone benefits! Vincent – Sorry, can’t say if they are or not, I just assumed that Blakey’s was the term for them not an actual company. I have the box at work and will re-post to let you know the brand of them. Or you can send me an email which is better and I will give you the info that I have. Won’t be selling them at my shop though….maybe I can through in a free pair if you get something else? Koko’s in East Finchley are brilliant. They saved a pair of C&Js for me. Church’s and C&J use them. Richard – Thanks for the info, by popular vote, I think KoKo’s is the ticket! Those who worked with the finest leather were called Cordwainers because their material came from Cordoba in Spain. They developed a soft, durable goatskin leather known as Cordwain � the very finest leather available � importation of which contributed to the growing prosperity of London. Over a period of time, those who processed the leather formed their own guilds. The shoemakers, however, retained the name of ‘Cordwainer’. I’ve used 5th Avenue on Goodge St and, though I am inexpert in these things, have been very impressed with the results. Llywelyn – Thanks for sharing…will have to try them out one day. I must agree, I lived near E. Finchley for 10 years & KoKo’s was the place to go for all round good shoe repairs and purchases too….. Their repairs were never questioned, however I did find them a little pretentious and a little pricey too… But quality repairs, without question… I have now moved to central London…….near the City. Although there are lots of ‘Pop In’ repair shops, I was not going to trust my Loakes…. To them…. After much searching I have found.’The Holy Grail’…. Hoxton Shoe Repairs.. Hoxton. N.1……I would (Now) NEVER go anywhere else… Just check out their reviews…..Truly FAB…. thanks for sharing…will have to try the one in Hoxton! Brighton has no cobbler worth talking about. 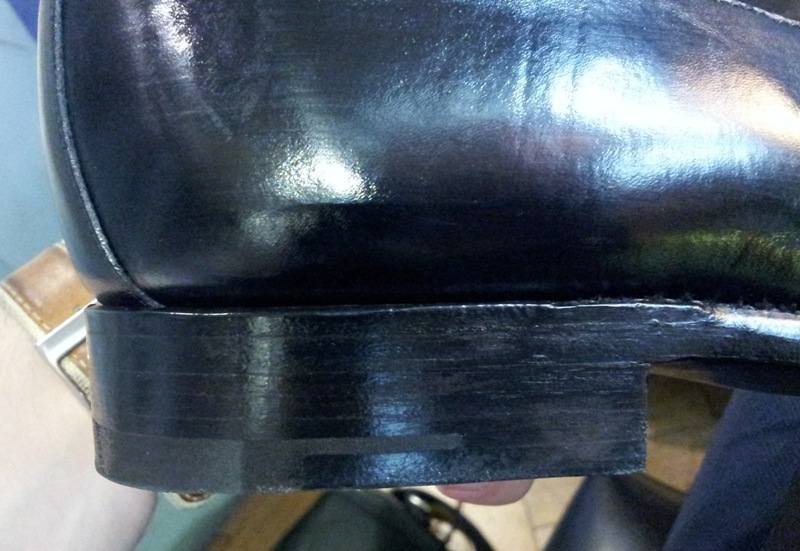 I have complained to my cobbler that leather and rubber soles fitted to my shoes have come away from the shoes over the last few years and within a short time from repair. Answer given by cobbler is that water is dissolving the glue, surely there is now glue available that is insoluble, any comments please.